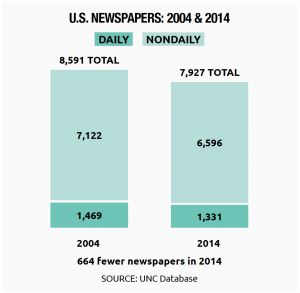 Today there are at least 600 fewer newspapers and almost 900 fewer owners than in 2004. Circulation has dropped 25 percent. As newspapers and owners fell by the wayside — and circulation declined along with profits — consolidation in the industry increased. The largest chains grew even larger, as a new type of owner emerged. The years between 2004 and 2014 were pivotal for the newspaper industry, reversing the good fortune of the previous decade when advertising revenue and profits spiked, while circulation declined very slowly. By 2004, it was apparent to industry analysts and investors that the migration of readers and advertisers to the internet threatened the soundness of the century-old newspaper business model. But few predicted how quickly that pace would pick up and profitability would decline. Then, the Great Recession of 2008–2009 delivered a staggering blow to advertising and the bottom line, driving many owners out of business and giving rise to a new kind of media baron. The surviving newspapers and their owners confront a significantly different business environment today than in 2004. This report analyzes data on more than 9,500 daily and weekly papers at three intervals between the end of 2004 through mid-2016 to document how dramatically the industry has changed in recent years. Updated through July 30, 2016, it draws on statistics in the 2004 and 2014 Editor & Publisher’s Newspaper Data Book and 2016 E&P data accessed online, as well as information shared by the consulting firm BIA/Kelsey. [i] Faculty and researchers in the University of North Carolina at Chapel Hill School of Media and Journalism supplemented the information in these two databases with extensive reporting and research. They conducted interviews with industry analysts and professionals, and analyzed U.S. Census data, as well as the financial records and press releases issued by newspaper owners. This analysis shows that the pace of change in the industry is accelerating, even as the underlying economics of ink-on-paper continue to worsen. i BIA/Kelsey conducted a telephone survey of newspaper executives and managers while Editor & Publisher employed a digital and mail survey of senior executives at individual papers. Both relied on the accurate feedback of respondents and have the type of reporting errors inherent in any survey. When we spotted errors, we corrected them in our database and will continue to update our analysis as new information becomes available. If you detect an error, please fill out and submit the “corrections” form available on our website, http://www.newspaperownership.com. How many newspapers are there in U.S. today? It depends on how they are counted. The number of newspapers listed in various databases ranges from 7,000 to more than 12,000. Industry spokesmen and analysts estimate there are 11,000 newspapers. After these adjustments, there were 8,591 local newspapers published at least once a week listed in the 2004 UNC database. Between 2004 and 2014, 664 newspapers vanished from UNC’s database. At the end of 2014, only 7,927 local papers were still being published. This total included large daily metros, such as the Los Angeles Times, as well as very small weeklies and dailies. Of the surviving papers in 2014, the vast majority — 6,474 — had circulation of less than 15,000.
ii The three national papers excluded from the database are The New York Times, Wall Street Journal and USA Today. In addition to shoppers and specialty publications, newspapers published less frequently than once a week were also excluded. As a result, some statistics in this report may differ from those listed on company websites. Even so, our adjusted total may be overstating the number of local newspapers, since many companies list geographic editions and supplements as separate papers. The significant cost of publishing daily print editions is likely to accelerate the trend to nondaily distribution in the coming decade. Only two nondailies shifted to daily distribution — small papers in Texas (clantonadvertiser.com) and Alabama (dailytrib.com), each with less than 7,000 circulation. The economics of weeklies and nondailies held up better than for dailies. Between 2004 and 2014, there was a net loss of 526 nondailies in the UNC database. While 1,561 nondailies were discontinued, 1,035 were added, including more than 100 dailies that converted to weekly. Most of the weeklies that closed were suburban editions of daily papers that were merged back into the larger metro paper. The majority of the “new” weeklies were also in the suburbs. Many were sections in daily papers that were spun out as separate editions. Increasingly, large media companies have been building networks of weeklies in suburban communities, in an attempt to put together a sizable audience that attracts advertisers back to print. For example, by 2014 two companies —Tribune Publishing and Shaw Media — produced and distributed almost all the weeklies in the suburbs of Chicago. Since 2011, more people have read news online than in a print newspaper, according to the Pew Research Center.7 So it is not surprising that newspaper circulation plummeted 20 percent between 2004 and 2014. The dramatic circulation drop occurred despite new rules and guidelines adopted by the industry after 2004 that allowed newspapers to count print and online readership that had been previously excluded.8 Circulation statistics in the UNC database primarily represent audited print-copy distribution, an admittedly imperfect measure since it does not count the increasing number of people who access local news online. However, readership data for most digital editions of the newspapers in this report are not widely available or comparable. Therefore, print circulation becomes a proxy — albeit imperfect — for the decline in influence and reach of local newspapers. About half of the decline in circulation stemmed from existing newspapers shedding readers, while the other half resulted from the closing of daily and nondaily newspapers. 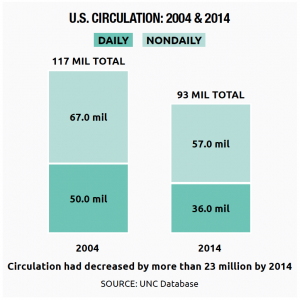 Daily circulation declined by 28 percent by 2014. Daily newspapers with more than 100,000 in circulation in 2004 suffered a stunning loss of 43 percent. By 2014, only 69 dailies had print circulation above 100,000, down from 102 in 2004. Circulation of weeklies dropped 15 percent. Larger nondailies with circulation over 50,000 dropped slightly more. As economic conditions worsened after 2004, a steady stream of owners decided to sell or declare bankruptcy. More than a third of newspapers changed ownership. Many independent family- owned newspapers were sold to the large chains. As a result, in 2014, the nation had 3,034 newspaper owners, down from 3,897 in 2004. As the number of owners decreased, consolidation — especially among the largest companies — accelerated. By 2014, the largest 25 companies owned 2,199 papers. The next largest 25 companies owned only 631 papers. The largest 25 companies in 2014 owned more than half of all dailies in the country — 721 out of 1,331 — and one-fifth of all nondailies — 1,478 out of 6,596. During the past decade, there has been extensive turnover among the largest owners. Several of the large chains in 2004 were acquired by other companies; others sold divisions or groups of newspapers. A traditional private chain, such as Hearst or Advance. A publicly traded company, such as Gannett or McClatchy. An investment entity, in which the principal owners and/or operators are hedge and pension funds, or private and publicly traded equity firms. In 2004, the largest 25 companies owned 1,776 papers. The publicly traded companies and private chains owned 80 percent of these papers. Investment entities owned only 20 percent. By 2014, the largest public and private chains in the country possessed only slightly more than 50 percent of the 2,199 papers now owned by the largest 25 companies. Seven large investment entities — five of which had not existed in 2004 — owned the other half. The next chapter, “The Rise of New Media Baron,” documents how and why investment entities have assembled large chains of newspapers in recent years, growing to such prominence in the industry. Speaking at a worldwide gathering of newspaper editors in 2005, News Corp. Chairman and CEO Rupert Murdoch noted downward readership trends and predicted somewhat facetiously that the “the last reader recycles the last newspaper in 2040.”9 The newspaper world has contracted significantly since that prediction was made. In 2010, in the wake of the Great Recession, newspaper advertising revenue fell below 1950 levels, adjusted for inflation. It has continued to decline every year since.10 Today there are many fewer readers, fewer newspapers and fewer owners than a mere decade ago. These dramatic changes, coupled with rapidly deteriorating economics, raise questions about the long-term future of ink-on-paper newspapers and pose difficult choices for the owners of surviving papers. 3 The Newspaper Association of America, “Newspaper Circulation Volume,” March 30, 2015, http://www.naa.org/Trends-and-Numbers/Circulation-Volume/Newspaper-Circulation-Volume.aspx. 4 Pete Chronis, “Saying Goodbye to the Rocky,” The Denver Post, March 3, 2009, http://www.denverpost.com/2009/03/06/saying-goodbye-to-the-rocky/. 5 Rick Edmonds, “Print Advertising Slump Bites Digitally Oriented Advance too,” Poynter Institute, July 26, 2015, http://www.poynter.org/2015/print-advertising-slump-bites-digitally-oriented-advance-too/360451/. 6 Andrew Khouri, “Layoffs Hits Freedom Communications as it ceases publication of L.A. Register,” Los Angeles Times, September 23, 2014, http://www.latimes.com/business/la-fi-la-register-20140922-story.html. 7 Amy Mitchell, Jeffrey Gottfried, Michael Barthel and Elisa Shearer, “The Modern News Consumer,” Pew Research Center Journalism Project RSS, July 07, 2016, http://www.journalism.org/2016/07/07/the-modern-news-consumer/. 8 Jim Conaghan, Interview with Penny Abernathy discussing digital and print readership, May 02, 2016. 9 “Murdoch’s Speech: Full Text,” The Guardian, April 14, 2005, https://www.theguardian.com/media/2005/apr/14/citynews.newmedia. 10 Mark Perry, “Free-fall: Adjusted for inflation, print newspaper advertising will be lower this year than in 1950,” Carpe Diem Blog, September 6, 2012, http://mjperry.blogspot.hk/2012/09/freefall-adjusted-for-inflation-print.html.